Editor’s note: As part of our series, “From Cow to Curd: A Look Across the Nation,” Cheese Market News takes a look at the cheese and dairy industry across the United States. Each month we examine a different state or region, looking at key facts and evaluating areas of growth, challenges and recent innovations. This month we are pleased to introduce our latest state — Wisconsin. COLLABORATIVE PROJECT — More than 100 dairy companies and organizations have joined together to help support the new Babcock Dairy Plant and Center for Dairy Research building project at the University of Wisconsin-Madison, which is expected to break ground later this year. WISCONSIN PRIDE — Dairy Farmers of Wisconsin is rolling out its new “Proudly Wisconsin Cheese” logo this month, which help Wisconsin-made products stand out in retailers across the United States. MADISON, Wis. — Wisconsin is “America’s Dairyland,” as seen on the state’s license plate slogan and reflected across the landscape that is dotted with more than 8,000 family dairy farms. Dairy contributes $43.4 billion annually to Wisconsin’s economy, and among U.S. states, Wisconsin ranks first in cheese production and second in milk production, according to Dairy Farmers of Wisconsin. “I like to say if you live in Wisconsin, you’re part of the dairy industry — you’re impacted one way or another,” says Patrick Geoghegan, senior vice president of marketing and industry relations, Dairy Farmers of Wisconsin. Wisconsin dairy farms produced 30.32 billion pounds of milk in 2017, second only to California. Ninety percent of that milk goes into cheese production, and 90 percent of the cheese produced in Wisconsin is sold outside of the state. Geoghegan notes that for decades, Wisconsin was a milk-deficit state, and cheese companies had to bring milk in from other states to run at full capacity. That is no longer the case, he says, as Wisconsin milk production has reached record levels for the last decade almost every year, despite decreasing farm numbers. “These are really challenging times for dairy farmers. They’re being paid what they were being paid in 1977, and it’s remarkable that they can stay in business in these conditions, but they’re working through the current situation,” he says, noting that Wisconsin’s farmers continue to look for ways to become more efficient. “We haven’t seen the milk dumping here that we have seen in other parts of the U.S.,” Geoghegan adds. “We make great cheese in Wisconsin, so there is a strong market for our cheese products. Dairy Farmers of Wisconsin, previously known as the Wisconsin Milk Marketing Board, is funded by the state’s dairy farmers through checkoff program dollars and tasked to develop markets for the state’s dairy products, which includes more than 600 cheese varieties. The organization is in the midst of a major rebranding project, both on its farmer-facing and consumer-facing sides. Dairy Farmers of Wisconsin in April unveiled its new name and logo, featuring a cow surrounded by the words, “Strong Farms, Strong Future.” This month, Dairy Farmers of Wisconsin will officially roll out its new “Proudly Wisconsin Cheese” logo, shaped like a ribbon, designed to show the award-winning nature of Wisconsin cheeses. Also this month, Dairy Farmers of Wisconsin is revamping its website, www.wisconsincheese.com, with the new logo and new photography. In addition to its new farmer and product logos, Dairy Farmers of Wisconsin has started to develop a program to help Wisconsin companies that are interested in exporting their dairy products. He adds that Dairy Farmers of Wisconsin continues to help dairy farmers through its marketing programs across the country, and the organization’s retail and foodservice promotions have gone up 26 percent over the last five years. Wisconsin’s plentiful water, forages and grazing land supported the growth of dairy farms in the 1800s, which in turn supported the rise of cheesemaking as waves of immigrants with cheesemaking knowledge from places like Switzerland and Germany settled in various pockets of the state, according to John Umhoefer, executive director, Wisconsin Cheese Makers Association (WCMA). Commodity cheeses such as Cheddar and Mozzarella, which Wisconsin has long produced, remain top cheeses in the state, though Wisconsin’s specialty cheese production has been rapidly increasing. One factor driving Wisconsin’s specialty cheese growth has been smaller and mid-size cheese companies, both start-ups and businesses passed down through generations, turning to value-added specialty varieties due to economic reasons. “Today when industry comes in, they tend to set up larger factories and economic industries of scale. Smaller companies have had to adopt different strategies,” Umhoefer says. Within specialty cheeses, he observes there is a growing market for naturally-smoked cheeses, while goat’s milk cheeses have taken off greatly in the state, and sheep’s milk cheeses also are seeing growth potential. Additionally, Wisconsin remains a leader in processing, cutting and packaging of cheeses for consumers. While Wisconsin is best known for cheese, it also produces high-quality butter, fluid milk, ice cream and dairy ingredients. Recently, Legreid says, Wisconsin dairy manufacturers have seen a resurgence in butter as well as favorability for other full-fat dairy products such as cheese and whole milk. Novel ice cream and fluid milk flavor profiles also have emerged, as well as the use of whey — formerly a disposable byproduct of cheese — in a plethora of products from baby formula to sports drinks. Wisconsin also is home to major national and international cheese and dairy contests hosted by WDPA and WCMA. Since 2003, WDPA has helped showcase the quality dairy products from Wisconsin and elsewhere through its annual dairy products contest held in conjunction with the World Dairy Expo in Madison, Wisconsin. The contest has grown from 100 entries its first year to 1,500 entries in last year’s event. It was the first national contest to shine a spotlight on all dairy products — such as Grade A, ice cream and dairy ingredients — in addition cheese. WCMA, which has records of competitions dating back to the organization’s beginning in the late 1800s, now hosts the U.S. Championship Cheese Contest and World Championship Cheese Contest in alternating years. Umhoefer points to reports from Wisconsin-based Emmi Roth USA that sales of its Roth Grand Cru Surchoix, which won the 2016 World Champion title, went up 200 percent following its win. Both WCMA and WDPA put major efforts into lobbying on behalf of their dairy processor members. WCMA has focused on both state efforts such as regulatory issues with the Department of Natural Resources and Department of Agriculture, and national issues such as the farm bill, tax reforms that affect farmers and cooperatives, and federal milk marketing issues. WDPA has successfully advocated for a number of issues over the years, including enforcing the Wisconsin butter grading seal, procuring state grants for dairy processors and fighting the legalization of raw milk sales to consumers. Five years ago, WDPA and WCMA joined with other industry and medical groups to form the Wisconsin Safe Milk Coalition, which has been effective in challenging raw milk legislation in the state. 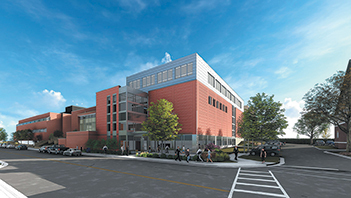 One of the most recent industrywide collaborations in Wisconsin is a $46.9 million project to renovate and build new space for the University of Wisconsin’s Babcock Hall Dairy Plant and Center for Dairy Research (CDR). According to CDR Director John A. Lucey, the project will include ripening rooms for all types of specialty cheeses, new cheesemaking equipment and a new spray dryer, additional space for cultured products and beverages that utilize dairy ingredients, a test kitchen and a state-of-the art auditorium for industry training and workshops. The project is expected to break ground in September and finish its first phase by 2020. Organizations and companies across the dairy industry have chipped in to help fund the new center, contributing a combined $18.5 million to date. CDR, which offers training, testing and product development services in addition to its applied research projects on dairy, serves both small and large dairy processors from Wisconsin and beyond. It receives 70 percent of its annual operating budget from Dairy Farmers of Wisconsin and the National Dairy Council. Umhoefer notes there is enormous respect for CDR in Wisconsin and among the dairy industry, which looks to CDR as the state’s research and development center.